Shortly, before the National Newspaper Publishers Association's (NNPA) annual Legacy Awards Gala, NNPA members elected veteran Chicago Crusader publisher Dorothy Leavell to serve as chairman of the group for the next two years (2017-2019). Leavell succeeds Washington Informer publisher Denise Rolark Barnes, who served in the role for the past two years. Leavell praised Rolark Barnes for her work over the past two years, noting that the campaign for the chairman's seat was never personal. Leavell's experience should bode well for the NNPA going forward, said Houston Forward Times publisher Karen Carter Richards. “Dorothy has a lot of experience in the organization and I think she will continue to move it forward,” said Richards, who was re-elected as first vice chair of the organization. Bernal Smith, publisher of the New Tri-State Defender, was elected second vice chair of the NNPA and Shannon Williams, the president of the Indianapolis Recorder, will continue in her role as secretary. Leavell has not only been a great soldier for the NNPA, but she's also a veteran of the Civil Rights Movement, said NNPA President and CEO Dr. Benjamin F. Chavis, Jr.
“I see her as someone to lead the fight fiercely for freedom, justice and equality,” he said. During her two-year stint as president of the organization, Leavell helped increase the visibility and international stature of the Black Press. 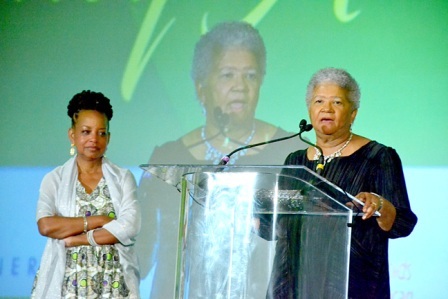 She was elected chairman of the NNPA Foundation and, as a member of the NNPA for more than half a century, Leavell has served in various roles and she's often been honored for her philanthropic and civic contributions. Leavell was honored as Publisher of the Year in 1989 and earned the Winnie Mandela Endurance with Dignity Award. Ever outspoken and never one to mince words, Leavell said she would immediately go after companies like General Motors and Ford to bring in advertising dollars to member newspapers.